The increased relaxation of marijuana regulations over the last few years has taken many forms, from medical legislation to, more recently, the DEA’s plans to make it more accessible to scientists for research. 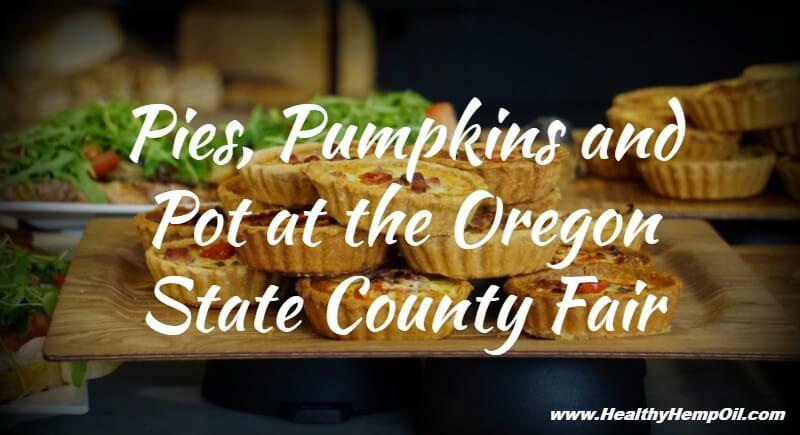 And this year, in Salem, Oregon, between August 26th and September 5th, this relaxed legislation will allow the first-ever public display of live cannabis plants at a State County Fair. Oregon’s county fair is no stranger to controversy, having displayed a piquant exhibit of body tattoo art twenty years ago. This year’s event, however, is a landmark in cannabis history. Among the usual offerings of giant vegetables, misshapen fruit and home-baked pies, a small security-guarded transparent tent houses the fair’s most interesting exhibit: nine tall, green and lush marijuana specimens. In 2015, the Oregon Fair included an informational booth about marijuana. Having received no complaints, the organizers decided to allow marijuana growers to display their plants at this year’s event. The Oregon Cannabis Business Council, which sponsors the weed tent, said it is the first time live cannabis plants have been displayed to the public at a state county fair. This is music to the ears of cannabis advocates worldwide, who have long sought to dispel the politically motivated myths surrounding the plant. After decades being secreted away in basements and warehouses, cannabis plants are finally going to be displayed for all to see, just like any other shrub or flower. The nine plants were picked earlier in August at the Cannabis Growers Fair in Oregon, where cannabis vendors pitched their products—everything from vaporizers to child-resistant bud bags and DIY pot-growing kits—to the public. Three specimens were picked by a panel of judges that included the author and cannabis expert Ed Rosenthal—also known as the Guru of Ganga—from each category: Indica (a heavy body high or “couch-glue,” as it is sometimes known), Sativa (a more uplifting and cerebral high), and hybrids. But fair-goers hoping to sample some will be disappointed. Unlike Amsterdam’s Cannabis Cup event, the strains won’t be judged on the potency of their buds. While the marijuana greenhouse might give off a heady smell of weed, only immature plants, whose flowers have not yet developed, are allowed to be displayed. This is because, even though cannabis is legal, it is still regulated. In fact, current legislation does not allow the transport of flowering plants within the state. That said, the director of the Oregon Cannabis Business Council, Donald Morse, said his group is working on getting permission to display cannabis plants in full bloom next year. Details are not yet finalized, but watch this space—2017 might be quite a year for marijuana! Not Quite the First Time? While the Oregon Fair is the first to showcase live marijuana plants, it isn’t the first to include pot. Denver’s county fair sported a Pot Pavilion, where, while no plants were present, visitors could take part in joint-rolling competitions using oregano. Unfortunately, the Pot Pavilion was permanently cancelled after visitors complained about being given THC-laced chocolate bars at the event, which was supposed to be drug-free. But with Oregon’s fair including only immature non-flowering plants, this kind of thing will not be an issue. And anyway, the Oregon Fair is not about promoting pot smoking—instead, sponsors say their goal is to show people over 21 what award-winning marijuana plants look like. Oregon legalized the recreational use of marijuana back in 2014. It went further earlier this year, when it allowed the sale of edibles, like pot brownies and cannabis-laced candy. Since early 2016, over $25 million have been collected in taxes on recreational pot. Oregon’s pot business is booming. In fact, anticipated revenue from cannabis sales through to June 2017 was recently quadrupled by Oregon’s Legislative Revenue Office to $35 million (from a not-too-shabby $8.4 million). Oregon is one of four states (alongside Alaska, Colorado and Washington) to have legalized the recreational use of cannabis, and voters in at least 10 other states, including Nevada, Massachusetts and California, can look forward to a ballot on this subject later this year. While the Federal Government still considers pot illegal and dangerous, this status quo is shifting. The majority of Americans now support legalization. Even one of the country’s most respected newspapers, the New York Times, recently made a strong case for an end to cannabis prohibition. Indeed, this outdated legislation has enormous social costs and hasn’t stopped anyone using marijuana anyway. According to the Drug Policy Alliance, the war on drugs has completely failed at reducing drug use, despite costing over $51 billion every year (money that, I’m sure you’ll agree, could be better spent elsewhere). While many of us still think of state fairs as quaint collections of giant vegetables, home-baked cakes and farm animals, time are changing—fast. Rewind to the 70s, and the idea of marijuana plants being celebrated publicly was unthinkable, the mad ravings of hippy day-dreamers. But pot is back on the map with a bang. Over half the nation’s states have legalized the medical use of marijuana, a nod to the plant’s many healing properties. Despite the Drug Enforcement Agency (DEA) sticking to its outdated view of cannabis as a dangerous Schedule 1 [MB1] substance, marijuana is no longer considered the devil-weed it once was. In fact, the plant is shedding its old government-sponsored stigma and becoming more socially accepted as a medicinal herb, a meditative aid and a relaxant no more evil than a glass of red wine. It may not seem like a big deal, but marijuana’s presence at the Oregon Fair is one of the legalization movement’s most down-to-earth achievements—bringing marijuana cultivation into the agricultural mainstream. Only at a county state fair can cannabis plants be recognized for what they are: a crop, just as worthy of respect and recognition as any other.